Noted theoretical physicist Stephen Hawking died this week. He was brilliant, no doubt about that. His nickname in school was “Einstein”, and he lived up to name by contributing mightily to the areas of cosmology, particularly in Big Bang Theory and Black Holes. He died of a rare form of Lou Gehrig’s disease (ALS) in that it progressed very slowly. He was 76. The belief that heaven or an afterlife awaits us is a “fairy story” for people afraid of death, Stephen Hawking has said. In a dismissal that underlines his firm rejection of religious comforts, Britain’s most eminent scientist said there was nothing beyond the moment when the brain flickers for the final time. ‘There is no heaven’. This is a true statement- for Mr Hawking- if indeed he maintained his rejection of God to the end. Hawking was the smartest man, as smart as than Einstein…seeking the mysteries of the universe all the days of his life- it was only death that revealed those mysteries to him. Sadly, it is too late. Hawking went the way of all flesh (with a nod to Samuel Butler). The way of all flesh is death, either to resurrected life in glory with Jesus, or to eternal death & punishment apart from Jesus. Answers In Genesis has a sensitive and thoughtful epitaph on Mr Hawking’s life, here. It’s times like these, when a famous atheist dies, that one ponders hell all over again. Hell is a monstrous doctrine. Not monstrous as in evil, for God is holy and just and all those who are sent there deserve it. Even those who are forgiven, like me, deserve it. It’s only the imputed righteousness of Jesus that diverts us from our fleshly final fiery resting place. I mean monstrous as in the definition of “extremely and dauntingly large; as in, “the monstrous tidal wave swamped the surrounding countryside”. It’s a huge thing to ponder hell, because it is for all eternity. Who can know? In a similar vein, I saw this photo on Facebook this week. Some people around here think it’s funny, others amusing, others intrigued. 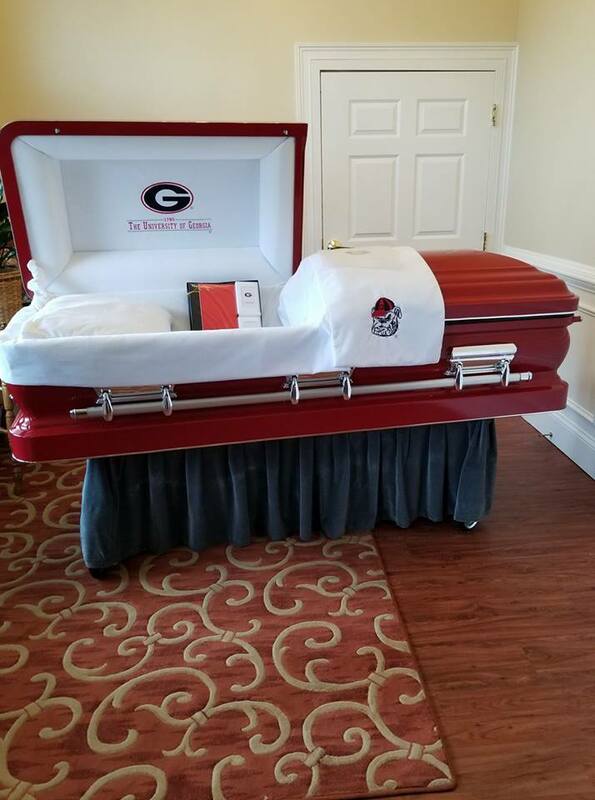 I never knew how much the idol of college football was alive and active until I came to Georgia. The University of Georgia Bulldogs’ arena is the Temple and the ‘Dawgs’ are worshiped by thousands of adoring fans. I don’t think it’s amusing. I think it’s blasphemous. Sure, people, bring your idol with you to eternity. What could go wrong? When my husband and I were in Puyo, Ecuador, a town then on the edge of the Amazon Rainforest and very remote, we spent a week. There were few industries in this one-dirt-road town. It truly was a frontier town, with one main road, plank sidewalks, a lonely hotel, and a few stores. One industry was coffin making. The people in that part of the South American country loved their highly decorated coffins. They would be made of heavy wood, and at the corners, one or all four, there would be clear glass. Inside the headlight-like small alcove would be blinking lamps, candles, statues of Mary, jewelry, or just lights. Perhaps they thought the lights could aid Charon as he guided the casket across the river Styx to the abode of the dead. Do you know what I wish? I wish that all coffins would have two pictures on them, one at either end. One, a picture of glory and the New Jerusalem. The other, a picture of the Lake of Fire. That would give funeral-goers something to contemplate. There is an afterlife, and all flesh is consigned to one of them. The difference is your position on Jesus. If you believe He is your risen God, having trusted in Him as savior and repented of sins which He forgave, you go to heaven. If you have rejected Him and failed to repent of your sins, you go to the Lake of Fire to be punished for your sins. You have committed cosmic treason, which must be justly punished..
“Therefore having overlooked the times of ignorance, God is now declaring to men that all [people] everywhere should repent, because He has fixed a day in which He will judge the world in righteousness through a Man whom He has appointed, having furnished proof to all men by raising Him from the dead.” (Acts 17:30-31). I believe it to be extremely sad that a man as brilliant as steven Hawkins, who in truth gave so much to the world at large, because of the brain God imparted to him, could be so very dumb when it came to his research on |God. He spent his entire life pursuing scientific matters and was labeled as ‘genius’ to the world at large & yet didn’t even have enough common sense to find out if God really existed. I wonder how many people earnestly prayed & interceded for steven Hawkins while he was alive that he might have come into the kingdom of light & eternal salvation!!!! The world at large is speaking of all the good he contributed to those of us living…and yet there he sits burning in hell, crying out for God’s mercy, suffering for his total refusal to acknowledge God in anyway while on earth. And yet, we who are living, do we not also have an obligation, to pray for those whom God has put on our hearts to pray for….how faithful are we in praying for those people like steven Hawkins & so many others that we know? Yes, we will have run the race, and will in all likelihood obtain the crown prepared by |God for each of us…but maybe we can classify ourselves as ‘dummies’ also,…since with all the knowledge & intimacy we have acquired with the master, Jesus, …how many of us can actually claim that we have been obedient to those small inspirations God gives us daily as we walk the path He has set out before us.! !